Discover a brand new experience at sea with Royal Caribbean's Perfect Day at CocoCay! 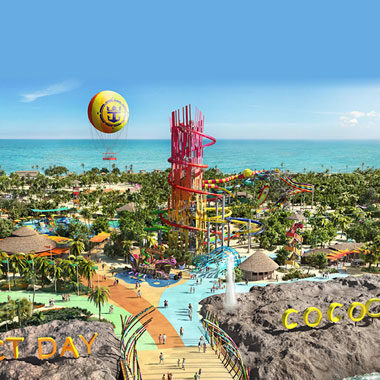 This incredible new resort will give all visitors to CocoCay an amazing experience. Helium balloon rides, huge waterslides, an exclusive beach club experience....Your Perfect Day is waiting for you! If you ever thought a sea day would be boring, then prepare to think again. The Royal Caribbean fleet boasts a jaw-dropping range of activities including a plethora of cruise industry firsts. For sports enthusiasts there are gyms, rock climbing walls and ice skating whilst for those who appreciate a little rest and relaxation there’s a spa, solarium, swimming pools and library. Kids will love the arcade, bumper cars and SeaPlex and adults might enjoy a little retail therapy in the designer boutiques on board. Or perhaps you want to spend some time working on you? The running track and fitness classes will help you achieve your health goals whilst the dance classes will help you master your salsa and the golf course will enable you to perfect your putting skills. Can you imagine a holiday resort that offers Broadway style shows like Hairspray, We Will Rock You and Cats? A holiday resort that has pop-up pianists that appear when you least expect them? How about an Aqua Theatre where acrobats dive from dizzying heights and the cast of Madagascar deliver a show stopping performance that will delight all ages? Doesn’t sound like your every day holiday resort does it? That’s because this is the Royal Caribbean experience, and as unbelievable as it sounds, you can experience all this and more on one of their ships. Put your feet up in style in one of the seriously well-designed Royal Caribbean staterooms. With the impressive choice of staterooms including Inside, Ocean View, Promenade, Balcony, Lofts, Suites and Studios; there’s a stateroom to suit every guest. As well as offering amenities such as televisions, telephones, mini bars, hair dryers and vanity areas, you’ll also have a Stateroom Attendant on call 24/7 to make sure your stay is extraordinary. Royal Caribbean has delivered several innovations in their on board accommodation including virtual balconies in the Inside staterooms that show a live feed of the view from the deck of the ship on a giant LED screen. This tech means that all of Royal Caribbean guests can now appreciate the incredible views of the ocean and port from inside their stateroom. For a really remarkable stay, consider the luxury Loft suites which are split over two decks and offer seriously spacious living. With floor to ceiling windows, your ocean view will certainly impress. Plus, if you do happen to book a Loft Suite, you’ll also benefit from added extras like priority check in and complimentary valet service. Opt for the Royal Suite Class and you’ll live the life of luxury as you’ll gain VIP access to Royal Genie and Concierge services amongst a variety of other perks including complimentary in room movies and all inclusive speciality restaurant access and drinks packages. And because Royal Caribbean always considers the needs of the families who cruise with them, you can book connected staterooms that sleep between 8-10 guests. These connected cabins also have their own private balcony for you to enjoy the sea views together. Who would have thought you’d have this much choice for sleeping at sea?! Cruising to 260 destinations world-wide, Royal Caribbean has the means to make your travel wish list come true. Alaska and Canada, the Caribbean, Dubai, Hawaii, Asia and the Mediterranean are all some of the destinations you can find itineraries for. From discovering beaches with pink sand in Bermuda to climbing the world’s tallest building in Dubai, the world is your oyster! Look out for itineraries featuring Royal Caribbean’s very own destinations; the private island Coco Cay in the Bahamas and Labadee Beach in Haiti. At these destinations you can swim, snorkel and sunbathe in your own exotic paradise! You’re in for a treat when you choose a Royal Caribbean cruise because the menus and restaurants are an experience in themselves! Firstly there’s the Wonderland restaurant which is loosely themed on ‘Alice in Wonderland’, here you can expect to find a delightfully whimsical yet elegant decor and dishes like ‘Veggies in the Garden’ and Baked Alaska. Then there’s Royal Caribbean’s collaboration with culinary superstar Jamie Oliver which has produced Jamie’s Italian that can be found on some of the newest ships to the fleet such as Anthem of the Seas. Royal Caribbean chefs have prepared a feast for your taste buds serving up everything from traditional American hot dogs and burgers at American Icon Grill, Far East favourites at Silk, contemporary cuisine at Chic and fresh Mediterranean influences at the Coastal Kitchen. With so many dining options on board, perhaps the hardest part of your holiday will be deciding where to eat next! Designed for the whole family to enjoy, Royal Caribbean provides perhaps the most all- encompassing experience for a broad spectrum of ages. Guests as young as 6 months are welcomed on board with facilities and programmes designed just for them. The kid’s programmes include: Royal Babies (6-18 months), Royal Tots (18-36 months), Aquanauts (3-5 years), Explorers (6-8 years), Voyagers (9-11 years) and two teen clubs for those aged 12-14 and 15-17. And for parents wanting a little time to let their hair down in the evening they can find peace of mind that their teens are in the Teen Only Hang Outs and their littlest ones are having a whale of a time with the Sitters at Sea. Book a holiday on one of the newer class ships in the Royal Caribbean fleet such as Anthem of the Seas, Harmony of the Seas and Ovation of the Seas and you’ll get to explore seven distinctive neighbourhoods. There’s Central Park with its boutique restaurants and lush flora and fauna, the Royal Promenade where you’ll find a variety of bars and shopping opportunities, the Boardwalk where you can reminisce in sweet nostalgia by playing arcade games and having a ride on the handcrafted carousel, the Pool and Sports Zone where you can take a dip or work off last nights dessert, the Vitality Spa where you can relax and get pampered, Entertainment Place where you’ll find the casino, theatre and comedy clubs and last but by no means least, the Youth Zone where the certified staff conduct sessions for play, crafts, video gaming and casual hang out areas and discos for teens.